Galway buskers will gather in force at the Spanish Arch this weekend for a "community-wide protest busk" to raise funds to continue the "battle to beat" what the community calls the "restrictive and prohibitive busking bye-laws". After a 9-9 for/against split vote at the city council meeting on Monday May 14, the new busking bye-laws were passed by Mayor Pearce Flannery's deciding vote. The new laws mean buskers will not be permitted to use amplification until after 6pm; performers under 16 will have to be accompanied by a parent or guardian; while ‘circle acts’ - buskers/street entertainers which draw large crowds, and which some feel impede movement through the city streets - will not be allowed to perform on Shop Street until after 6pm. The Galway Buskers' Community has described the new bye-laws as "not reasonable, discriminatory, possibly illegal, and will be impossible to enforce". To protest against the laws, the community will hold the 'No Busking Bye-Laws' event at the Spanish Arch on Sunday May 27 from 7pm to 9pm The event will see buskers and street performers, along with local and international musicians, performers and entertainers "join together for a community-wide protest busk". Independent city councillor Mike Cubbard, who voted against the new bye-laws, said their passing was "a sad and very damaging day for our city" that sends out a negative message about Galway. However Cllr Colette Connolly, who voted in favour, said they were necessary as "performances that attract large crowds have created problems of access, particularly for those with a disability, and anyone in a wheelchair or those who are aged and parents with buggies". Cllr Cubbard has questioned whether local authority bye-laws are the appropriate way to deal with this. He pointed out how the busking community has a code of conduct for good practice which has been operational for several months. "Like many new codes of conduct it will need time to work to the level expected of it," he said. "Most buskers want to do well by shop-holders as only working together will both be successful." 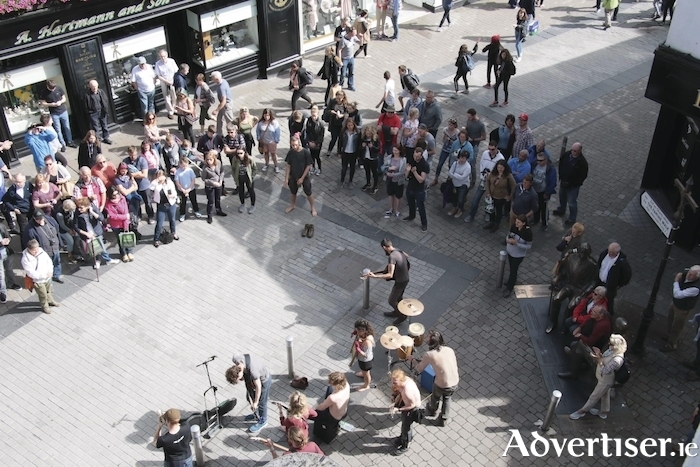 The Galway Buskers' Community presented its code of conduct to the city council on "many occasions over the past year, noting the 90 per cent compliance with it". The buskers said they "repeatedly" invited City Hall to meet with them and "work out a compromise to the bye-laws". However they claim their "invitations were ignored until the last minute, when a working group was convened May 4". The buskers accuse "a strong lobby of a handful of businesses" of "refusing to compromise". In a statement the community said: "These bye-laws, as currently written, not only ban all forms of amplification and circle acts, including theatre, dance, sculpture, circus, acrobatics, clown, mime, and magic, from the protected street-scape before 6pm; they ban all busking after 11pm, ban drum kits completely, restrict the freedom of expression, force buskers to stop if they draw a crowd, and interfere with the way buskers queue. The bye-laws will put most of our community off the streets, out of work, and by extension, drive many vibrant, gifted, diverse performers out of our city."